The Mandalay Bay Shark Reef is not something that is for the faint of heart. Get ready to see an ocean wonderland that includes some ferocious sharks mixed in with 1,200 species ranging from tropical and fresh water fish to rays and reptiles. 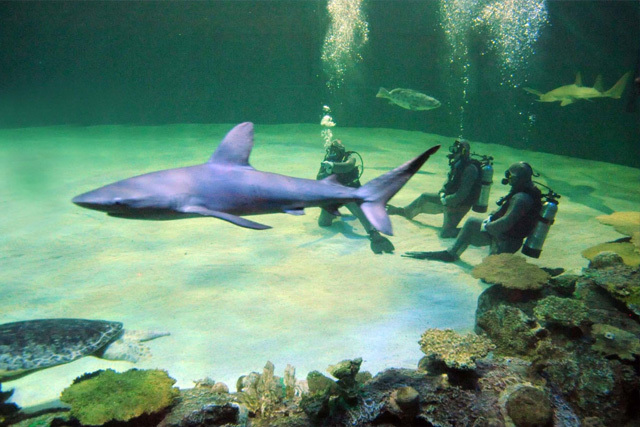 When it comes to sharks the Shark Reef promises 15 different species of sharks. You will have a chance to see blacktip and whitetip reef sharks, sandbars, sand tigers, bonnetheads, white spotted bamboos, port jacksons, zebras, and lemon sharks. 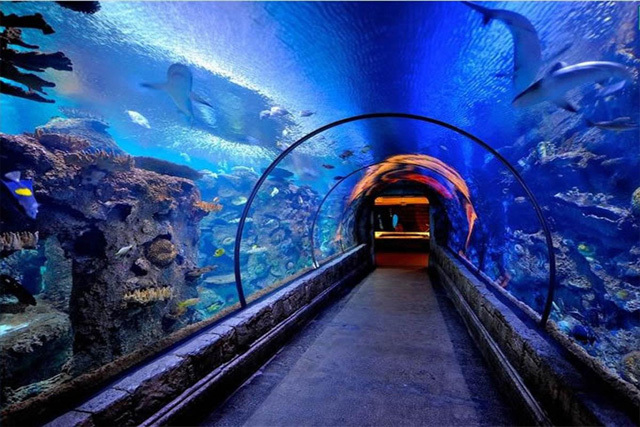 The Shark Reef at Mandalay Bay Hotel is accredited by the American Zoo and Aquarium Association. The reef reaches a depth of 22 feet and is surrounded in 2 million gallons of water. The Shark Reef is set up to appear as if it's an Ancient temple that is sinking into the ocean. As you travel through the exhibit, you have a chance at seeing things that you will not be able to see anywhere else. For instance, near the beginning of the Shark Reef is a group of nearly extinct golden crocodiles. Despite there only being about a dozen in existence, the Shark Reef is home to five of these crocodiles. Sunday - Thursday, 10 a.m. - 8 p.m.; Friday - Saturday, 10 a.m. - 10 p.m.
My youngest daughter alex liked touching the rays in the pool and enjoyed listening to the info on the land held radio supplied all about the creatures that were in the aquarium. My eldest daughter abbie was amazed that the divers in the shark reef cleaning the inside had sharks swimming just inches away from them and didn't show any fear. We all enjoyed the day at the shark reef and would recommend for a grat rememberal day out. Your fees for people who live in Nevasa are way too high. You could go along way in relieving some of the ignorance of Nevada's workers and students if you weren't so devoted to the dollar. The shark reef and freshwater aquariums were awesome so got the three park thing for like $50 we did the lion exhibit and the shark reef the circus curcus rides, But the best thing outta all was the shark reef if your a reefer like myself and your $$ was alreasdy worth it don't miss the very rare shark ray and watch out for the pirannas lol.